How loud is your worksite? That’s a question employers should be able to answer with a number. 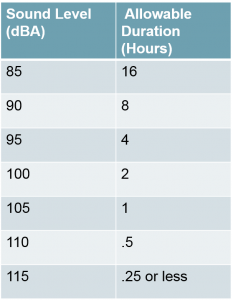 OSHA’s Noise Standard requires employers to have a hearing conservation program in place if the noise levels in their worksite reach 85 decibels (dBA) or higher during an 8-hour shift. A hearing conservation program must be implemented at, or above, a TWA of 85 dBA, as per OSHA. A decibel level of 85 is not hard to reach — a regular household blender even registers at 88. But, for a charge to stick, the sound must be sustained throughout the workday. Workers who are around constant loud noises over 85 dBA are at the highest risk of hearing damage. Every year, at least 22 million workers are exposed to potentially dangerous noise levels at work. In 2017, employer penalties reached $1.5 million for failing to protect workers. OSHA also estimates that $242 million is spent in workers compensation claims for hearing loss every year. Establishing a hearing conservation program can keep you OSHA compliant, save money, and protect workers. Monitor the noise on your worksite. Your program will be based on how much noise your worksite creates. The traditional method is to use a decibel meter to measure the average noise exposure over time. Another way is to focus on the noise generated by specific tasks such as using a jackhammer. NIOSH offers a helpful power tool resource with the sound information for common tools. The CDC also created the SLM workplace noise app for iPhone to help monitor noise levels. Control noise. Administrative controls can be used to limit the time employees spend around noisy equipment. Employers should also take noise levels into consideration when choosing equipment. It may be worth it to spend more on tools with reduced noise. Use hearing protection. Everyone’s ears are different, so employers should provide a range of PPE such as earmuffs and plugs so employees can find what works best for them. Schedule audiometric testing. 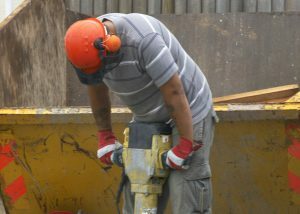 Workers should be tested at least once a year to see if they are experiencing any hearing loss. Worksite Medical offers convenient audiometric testing. Evaluate your program. If the audiometric testing reveals that workers are still suffering from hearing loss, then employers may need to take even more steps in hearing conservation. Provide training and education. Employees might not realize the importance of wearing proper PPE, so it’s important to set time aside to help workers understand how and why they need to protect their hearing. Do you need help with creating a successful hearing conservation program? Worksite Medical is here to help! Right now, you can save up to $400 when you schedule on-site audio exams. We will bring the entire clinic right to your job site – See if we travel to you by clicking here. Check out some of our free resources below! Are you looking for a way to keep your team safe, while also limiting risk and increasing production? Simplify your medical plan today. We help team leaders like you develop less disruptive, more convenient occupational health plans that comply with complex industry standards, thus creating a healthier, more productive workforce. Take control of your medical testing program, and make sure your team is within OSHA’s requirements.